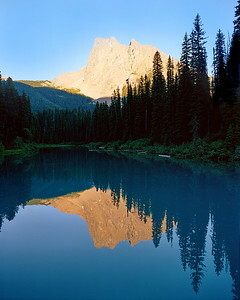 Emerald Lake in British Columbia’s Yoho National Park provides a majestic view of Mount Burgess. Silt carried by streams from melting glaciers high in the Rocky Mountains gives Emerald Lake a deep, rich turquoise color during the daytime. 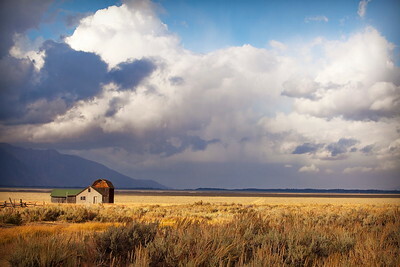 Grand Teton National Park is part of the Rocky Mountains, with its mountains rising from the floor of Jackson Hole without any foothills along an active fault mountain system 40 miles long by 7 to 9 miles wide. 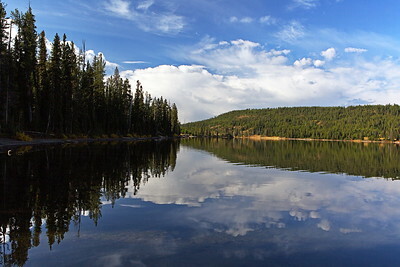 The area is considered to be one of the most picturesque places in North America and is home to moose, coyotes, black bears, badgers, bald eagles, elk, martins, squirrels and several species of trout. 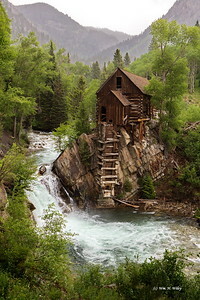 Crystal Mill is a wooden powerhouse built in 1892 and is located on a rock outcrop above the Crystal River in Colorado. It wasn’t an easy find, as the mill is located six miles into the mountains and is accessible only by foot, 4x4 Jeep or ATV. Two silver mines were located nearby on the mountainside. Today the mill is on the National Register of Historic Places and probably the most unique subject I’ve ever photographed. One of the iconic views in Grand Teton National Park, the Snake River overlook is the location of one of Ansel Adams most famous images photographed over 70 years ago. 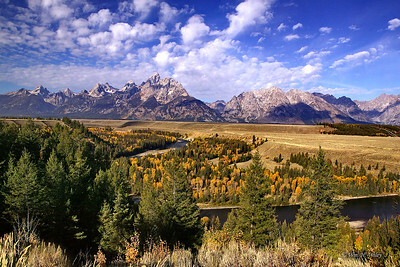 It provides a spectacular view of the Snake River leading up to the Grand Teton mountains. Beautiful year around, autumn is particularly picturesque due to the many deciduous trees along the Snake River. 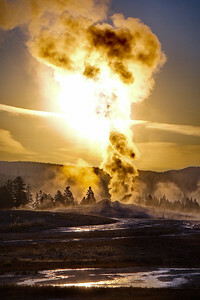 Unlike the millions of typical shots of Old Faithful in Yellowstone National Park, this image shows a golden sunrise behind the world-famous geyser. Even the ground steams as the morning sun burns off the rising moisture. This shot was taken in mid September at the height of the fall colors, when aspen trees paint the forest in shades of yellow, gold and red. Aspen trees are a “pioneer” species of tree, meaning that it is one of the first trees to grow in an area that has been cleared by some type of disturbance, such as a fire or avalanche. 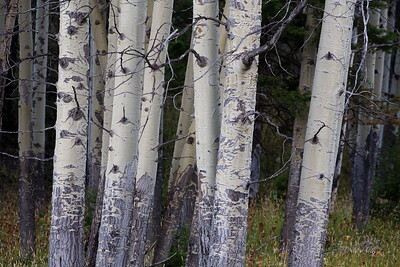 The quaking aspen is unique because it reproduces by growing new trees from long horizontal roots that grow underground and send up new shoots, meaning that new trees are all clones of the original tree. This makes the trees one single organism. 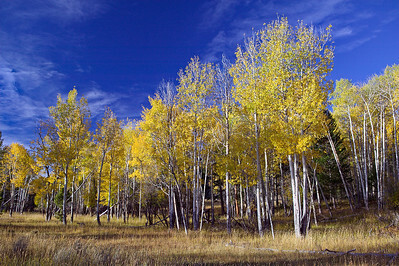 The aspen’s brilliant fall colors are because the leaves lose their chlorophyll, revealing their natural pigment. 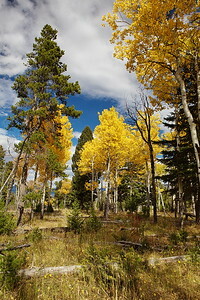 A hillside or slope will look dramatic in autumn because all the trees are connected and turn yellow and lose their leaves at the same time. 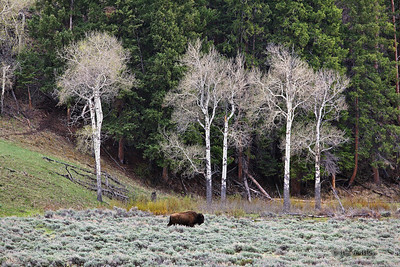 A lone bison traverses through sedges and grasses with several ghostly aspen trees in the background. Usually a communal animal, male bison spend most of the year alone or with other bulls – except during the rut, or mating season. The Yellowstone River is the last free-flowing river in the lower 48 states. From its headwaters in Lake Yellowstone 670 miles downstream to the Missouri River in North Dakota, the Yellowstone flows in its natural state, undammed and untamed. In addition to the Yellowstone River, many of the spawning streams provide cutthroat trout and other critical food sources for grizzly bears in springtime. 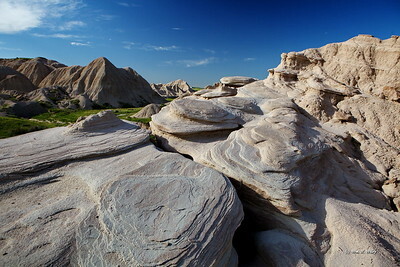 Spectacular rock formations at Toadstool Geologic Park show the effects of water and wind over millions of years. Located in the extreme northwest corner of Nebraska, the park is sometimes called the Nebraska Badlands. Many unusual geologic formations are visible and the park has yielded some scientifically useful fossil deposits, some of which are still evident as "tracks" in the rocks. 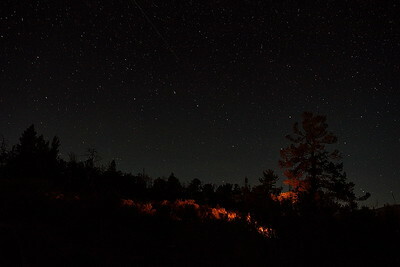 A shooting star is faintly visible above a Yellowstone hillside of lodgepole pine trees. The Milky Way and numerous constellations are visible in the clear, clean skies above Yellowstone and Grand Teton National Parks. 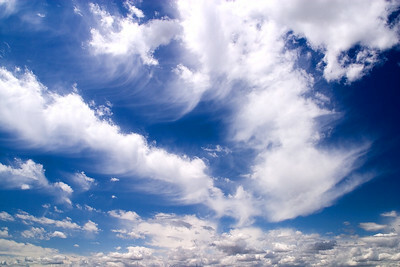 In the Sandhills of central Nebraska, great white puffy clouds are almost an everyday occurrence. 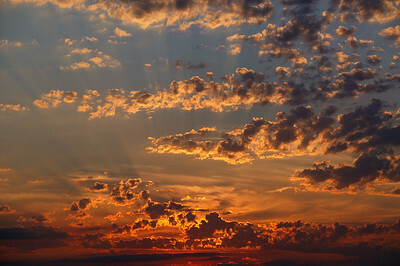 Like winter snowflakes, cloud formations are always unique and never identical. 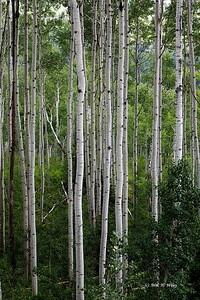 Aspen trees have the widest range of any tree in North America. They are very important to the forest ecosystem, as they are usually the first trees to grow after a forest fire. Known for their bright golden-yellow leaves in autumn, aspens provide valuable forage for deer and elk, while the underlying plants provide food for mice, rabbits and voles. In turn, these small animals attract bobcats, coyotes and mountain lions. 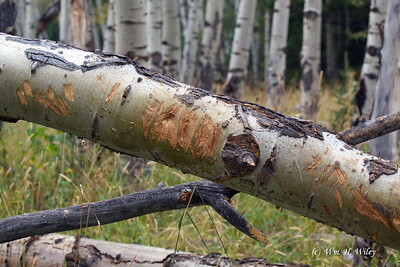 Around ponds and streams, beavers usually eat aspens before any other trees. 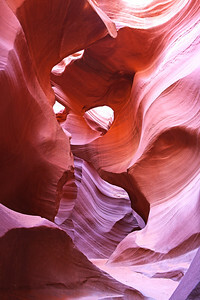 Lower Antelope Canyon is located in the American Southwest in north central Arizona. It’s one of two slot canyons on Navaho land, formed by flash floods over thousands of years. Approximately a mile long, it’s essentially a 100-foot deep crack in the ground. 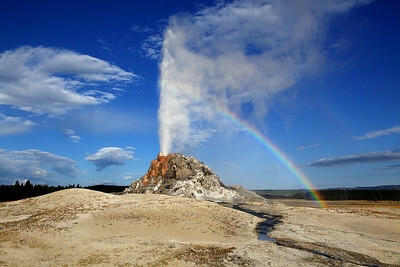 When the sun shines down on its swirling sandstone walls a rainbow of colors makes it an amazing sight to behold. 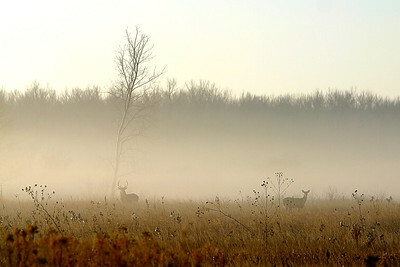 Shortly after dawn this buck and doe were spotted in the DeSoto National Wildlife Refuge. Created in 1958, the refuge is located the migratory bird corridor of the Missouri River floodplain and provides essential habitat for resident, migratory, and endangered species. High quality floodplain forest, grassland, wetland, sandbar, and river habitats support diverse and productive populations of migratory waterfowl, shorebirds and semi-tropical birds, as well as rare, threatened, and endangered species including the pallid sturgeon, piping plover and least tern. 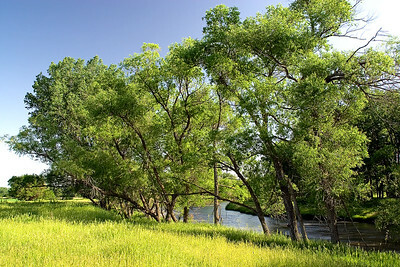 Taken along the Niobrara River in north central Nebraska, this scenic reflects the deep greens and blues of an early June morning. 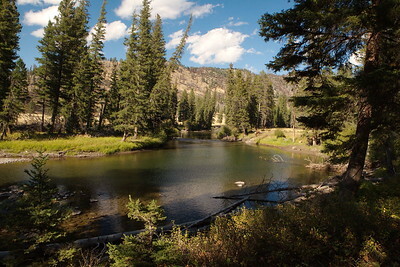 Named in 1867 by a party of gold prospectors, Slough Creek is a remote tributary of the Lamar River in northeastern Yellowstone. It’s considered one of the best cutthroat trout fishing locations in America and is prime habitat for grizzly bears, wolves and bison. Nighttime offers a quiet, unimpeded view of the stars and, with a little luck, a chorus of wolves howling in the darkness. 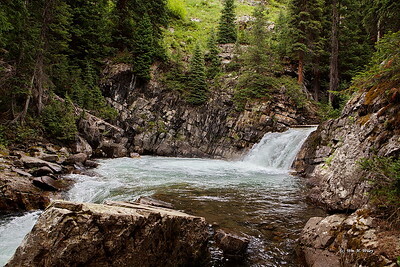 This beautiful waterfall and pool are on Crystal River in Colorado, located near the ghost town of Crystal. The river flows through a narrow valley with numerous snow slide runs, rockfalls, and other hazardous terrain and is nearly impassable to vehicles other than ATVs and off-road motorcycles. 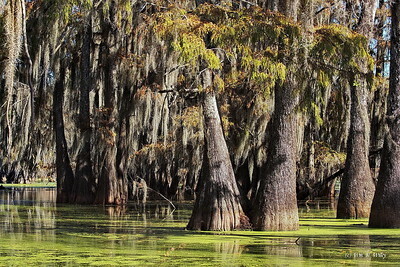 Perhaps because of its isolation, beautiful spots along the river remain unspoiled. Arches National Park is located on the Colorado River 4 miles north of Moab, Utah and has the largest concentration of natural arches in the entire world. Arches National Park is known for containing over 2,000 natural sandstone arches, in addition to a variety of unique geological resources and formations. Arches National Park is located on the Colorado River 4 miles north of Moab, Utah. 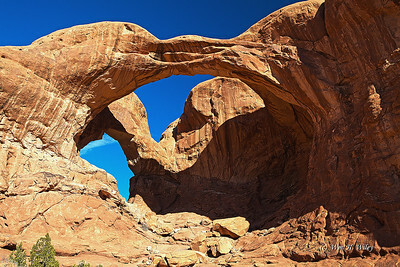 The Double Arch is an incredible formation of arches within the Windows area of the park, having the largest concentration of natural arches in the entire world. Double Arch takes its name because it consists of two arches that share the same stone as a foundation for both of their outer legs. 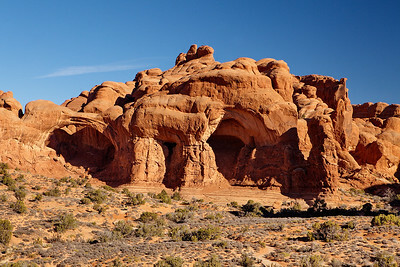 Double Arch was formed by downward water erosion from atop the sandstone, rather than from side-to-side water erosion. Arches National Park is known for containing over 2,000 natural sandstone arches, in addition to a variety of unique geological resources and formations. Alberta Falls in Rocky Mountain National Park was named by a relative of Bill Wiley…the sister of his grandfather, Claude L. Morrison (1874-1962). Alberta Morrison (1867-1949) married Abner E. Sprague (1850-1943) and they were some of the first settlers in the Moraine Valley area, which later became part of RMNP when it was designated a national park in 1915. The two were true pioneers, first living in a sod house in the mountains and later building and managing two tourist ranches, Sprague’s Lodge and Steads Ranch. 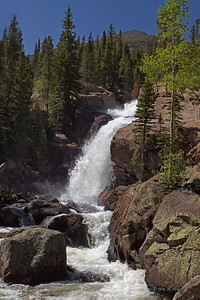 Abner named Alberta Falls after his wife and later dammed a nearby creek to create Sprague Lake. White Dome Geyser in Yellowstone National Park is named for its massive 12-foot high geyserite cone, shooting steam about 30 feet into the air every 15 minutes to 3 hours. The opening of the cone is only a few inches wide and as minerals build up on the outside, the cone raises. As that happens, the width of the inside of the geyser is reduced, making it possible that in time the cone will seal itself, making the geyser dormant. 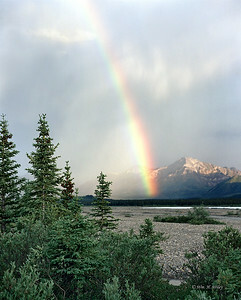 The Athabascan name Teklanika means “glacier creek.” Located in Denali National Park, the Teklanika River is an excellent example of a “braided river,” meaning the water channels spread out and are constantly crossing one another. Glacier melt off provides some of the water, and spring ice jams contribute to the continuous braiding of the river. Depending on the season, the volume and speed of the river can change dramatically. Taken on the Iowa side of the Missouri River, a summer sunset displays a brilliant range of red, orange and yellow colors. Fall colors abound in a quiet meadow in Grand Teton National Park. 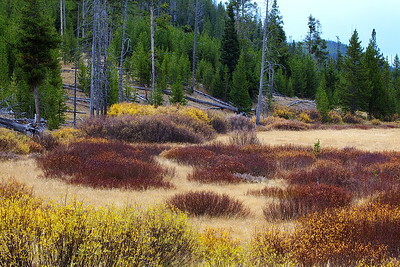 Easily a place that might not be noticed, this meadow provides solitude with a splash of yellow, green, brown and red. 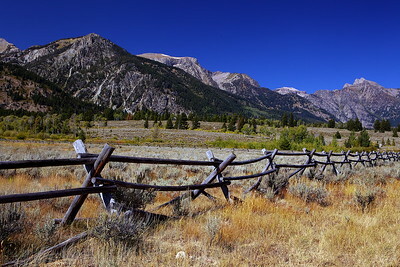 The Tetons are considered to be one of the most picturesque places in North America and is home to moose, coyotes, black bears, badgers, bald eagles, elk, martins, squirrels and several species of trout. 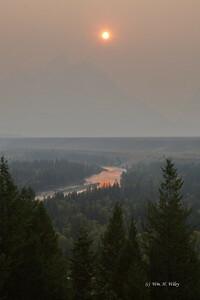 Atmospheric smoke from forest fires in September 2017 create a barely perceptible silhouette of the Grand Teton Mountain taken from the Snake River Overlook. For weeks the Grand Teton National Park and surrounding area were congested with gray smoke from 24 separate fires in Montana caused by lightening strikes. From late September to mid-October, bull elk prepare for the rut season by rubbing their antlers against trees to remove velvet that has grown throughout spring and summer. They also thrash their antlers against branches and tree limbs, a behavior known as “raking,” which marks their territory with a scent from glands near their eyes. Besides strengthening neck muscles, raking is a sign of dominance, showing other bulls in the area that the elk is ready to battle for the right to mate with the cow elk in its harem.